Why does a thunderstorm make my pool turn green? A thunderstorm will sometimes turn an outdoor swimming pool green; this article tells you why. It’s all about the nitrogen. Thunderstorms have lightning and rain as well as a few resounding claps of thunder. The flashes of lightning, apart from lighting up a night sky, create nitrogen in the atmosphere and the rain washes that nitrogen down and into your pool. Nitrogen is a plant food, and a very good one. The algae in your pool, and there are always traces in even the best maintained pool, are plants and so they thrive on the extra nitrogen that is washed down when the heavens open. Algae are microscopic and so, when there are just a few of them, they are invisible to the human eye but feeding on the nitrogen, they bloom and multiply very quickly until there are enough to turn the pool water green and murky. So that’s why it happens, but of course you don’t want it to happen. So what can you do about algae? One way of avoiding a thunderstorm turning your pool green is to shock the pool with chlorine as soon as possible after the storm. However, recovering an algae infested pool can be a difficult and time-consuming task so prevention is better than cure. 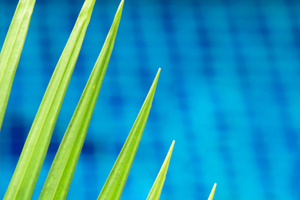 The more algae-free your pool is at all times, the less likely you are to have problems. Keeping your pool water in balance is the key. Oxidising the water regularly will get rid of organic wastes and other material that the algae can use as food. Keeping sanitisers at a consistent level will greatly reduce the algae population as will using a specific algaecide. Algae grow very rapidly in warm water and bright sunlight so the best time to apply an algaecide is mid morning or early afternoon. The algae will start to grow on the sides of your pool so regular brushing is a good idea to get them off the walls and into the water where the pools filtration is more likely to remove them. If you would like some specific advice on algae control – or indeed any aspect of pool maintenance – and would like to find an appropriate pool professional in your area, there is a contact button at the top of this article that can get that process started.